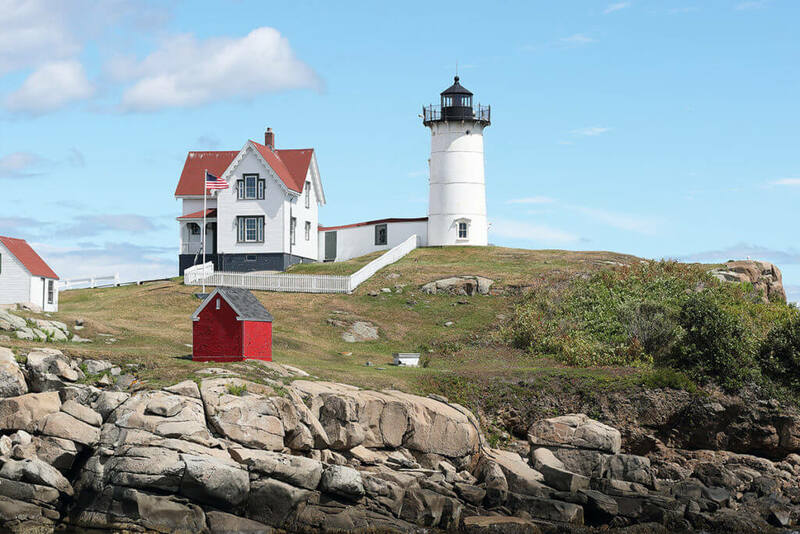 This is a scenic and historic 130 mile/4 1/2 hour + ride that hugs the New Hampshire & Maine seacoasts from Hampton on up to Biddeford, Maine and then loops inland and back down to New Hampshire. If you chose to follow the entire route, it ends up at the Holy Grail Restaurant in Epping NH. If you chose to follow the entire route, it ends up at the Holy Grail Restaurant in Epping NH.It is, of course, not necessary to follow the entire route. You are free to start and end wherever you chose to. One of the advantages of a tall but narrow route like this is that there are several points where you can decide you’ve had enough and chop off the top of the route by “turning left” (west) and going over to the return side of the loop. You can also just jump on I-95 and buzz straight back south. Since the full route is a 4 1/2 Hour Drive, we started at Rogan’s Village Bake Shop at 31 Portsmouth Ave. in Exeter so we could fortify ourselves for the Drive. You are obviously free to review the route and start wherever it works best for you. Rogan’s is not in “Downtown Exeter.” Ports­mouth Ave is the main road that runs from Exeter, through Stratham to Portsmouth. From “downtown Exeter” take Water Street (the street with all the storefronts) east and across the Bridge. Once across the Bridge, you will be on High Street. Go a couple of hundred yards to a traffic light and that’s Portsmouth Ave. Turn left on Portsmouth Ave, and Rogan’s will be 300 to 400 yards ahead of you on the right side of the street. We left Rogan’s at noon — back down Portsmouth Ave to High Street. Turn left (east) on High Street heading toward Hampton. I won’t give you the turn-by-turn directions here – see the attached Map and Directions for those – but will give you the high points of what you can expect to see on the Drive. The route takes you east right to Route 1A at the water’s edge in Hampton. You’ll then head north along the shore and pass Fuller Gardens and the Fuller Estate on Boar’s Head. Then Rye Harbor and Rye State Park and Wallis Sands State Park all before coming to Odiorne State Park which is the site of one of the forts that defended the entry to Portsmouth Harbor – and the Portsmouth Naval Shipyard – during several wars. From the Common, continue on Route 1B through the Town of New Castle – with a two block side trip to Fort Constitution (formerly Fort William & Mary) if you’d like – watch for signs.Route 1B will then take you back onto “the mainland” entering the Old South End of Portsmouth. Now it gets a little tricky here. As you cross the entry channel into the South Mill Pond, you will see the Saunders Fish Market on you right. Bear right as you pass Saunders to stay on Marcy Street. In a block or two you will see the old South Meeting House on your left. In three or four more blocks you will pass Prescott Park with its lovely gardens on your right and the Strawbery Banke Museum grounds on your left. Now, pay attention here – we’re getting into one-way streets. As you pass Strawbery Banke, watch for Court Street on your left. Turn Left onto Court Street and go one block to Atkinson Street. Turn Right onto Atkinson and go one block before turning right again. You will now be on State Street right at the New Hampshire end of the Memorial Bridge that will take you across the Piscataqua River and into Maine. The Memorial Bridge will take you to Badger’s Island and then there is another smaller bridge to the mainland (Maine) You will see Warren’s Lobster House on your right then go up a short rise and watch for Route 103. Follow Route 103 for a pretty ride all the way up to York Harbor. There Route 103 will “T” into Route 1A. Turn right on Route 1A and follow it on past the entrance to the Stage Neck Inn and also past the York Harbor Inn before it leads you to the Long Sands Beach of York. Next stop, the Lighthouse at Nubble Point — At the end of Long Sands Beach look for Signs to The Nubble. You will be turning right off Route 1A on the Nubble Road. Follow it to the end. The Lighthouse at Nubble Point is probably one of the most photographed building in the world. As you leave “the Point” take Nubble Road to the right to continue on around this promontory. You’ll pass Brown’s Ice Cream on your left (and old favorite) and then curve around a bit. Be watching for Kendall Road on you right. Kendall Road will take you one block over to the better views that can be seen from Ocean Ave. Look at the difference in the architecture on this, the north side of the Point. It is obvious that the north side was developed during the Victorian Period, while the south side – where you came onto the Point – was developed much later. As you drive along Ocean Ave you will see Short Sands Beach ­on your right. Bear right to stay on Ocean Ave as it takes you along Short Sands and into the little commercial area of York Beach. Watch for the Goldenrod Restaurant on your right. This is another BIG favorite of mine and is the place with the Saltwater Taffy Pulling Machines in the window. If you’ve got the time…..
North of York Beach we will turn off of Rte 1A onto Shore Road to stay closer to the coast and do a little side loop off Shore Road to drive past some of the great stone-ma­sonry work to be seen on the houses along Agamenticus Ave. in Cape Nedick. Agamenticus Ave takes you right back to Shore Road (turn right onto Shore Road) which will then take a winding path to Perkin’s Cove as we enter Ogunquit. Perkin’s Cove is a cute little concentration of arts and crafts shops. Again, if you’ve got the time….There is also a one mile walking path called The Marginal Way that runs right along the shore from Perkin’s Cove to “downtown” Ogunquit. AS you leave Perkin’s Cove stay straight on Route 1B into the Town of Ogunquit and get on Route 1 to get through Wells, Maine (Antique Alley) and past the Wells Auto Museum before turning off on Rte 9 to head for Kennebunkport — Walker’s Point (Pres. George Herbert Walker Bush) and Cape Porpoise. Our last stop before we leave the Maine Coast will be Goose Rocks Beach ­where the sand is so white and so fine that it squeaks under your feet when you walk on it. About 2 ¾ miles after you leave Cape Porpoise heading northeast on Route 9 look for a farm with a Clock Tower on the barn. Turn right there onto Dyke Road. Follow Dyke Road for about a mile (it hooks to the left) until you can see/hear the ocean on your right. There’s not much parking, but a walk on this beach is worth it. From Goose Rocks we will head to the thriving metropolis of Biddeford and then turn towards home by following Maine Route 111 due west (inland) to Alfred. Then South on Maine Rte 4 through the Berwicks and cross back into New Hamp­shire at South Berwick. A quick side trip through Rollinsford —just because it’s kinda of a neat, small “Mill Town.” Then on into Dover on Portland Ave. and then we’ll do the run right down Main Street (actually Central Ave) before slipping out of Town on the back roads. I hope you enjoyed this route as much as I did.